Large Superb Antique BACCARAT Cut Crystal Casket Box with Fine Gilt Bronze Mounts. Elegant Ridges Decorate the Body and 'Bombe' Lid. The Main Body and Sides is is Exquisitely Mounted with a Very Fine Gilt Bronze Acorn Tree with Ripe Acorns and Leaves. The Gilt Bronze Frame is Intricately Sculpted with Stars. The Keyhole is Embellished with Leaves. 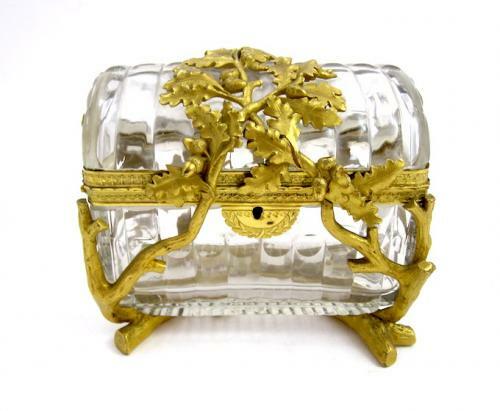 The Box Rests on Gilt Bronze Branches. A Super BACCARAT High Quality Rare Casket.